Fixed a few minor issues on shared mailbox with cache mode. Fixed issues in exporting appointment to PDF with cache mode. Fixed problem in upgrading multiple installations of Calendar Browser. Added a new feature of exporting Calendar Browser appointments to PDF. Avoid Outlook restart after adding CB group. Auto add Calendar Browser group for the administrator. New design for Calendar Browser Administrator Settings and Overview. Added the loader image everywhere needed. Improved functionalities in the Calendar Browser Overview. Fixed issue in displaying recurring appointments in Overview. Fixed issues with shared mailbox. The "Manage" and "Overview" buttons were visible in the personal calendar even if both had been hidden from the administrator settings. The double booking prevention was not working with auto-booking. In Outlook 2007 the Calendar Browser and TimeCard buttons were overlaping when both were installed on the same machine. The Calendar Browser ribbon buttons are no longer displaying in an additional Add-ins tab in Outlook 2010 and 2013. Possibility to edit the captions of extra booking information. Fixed problem in showing recurring appointments in Overview. Fixed problem in creating appointment from search window if Project field is mandatory. Improved performance of the Overview and when loading CBOverview.exe then a new user friendly message is displayed. New design for the Excel report. New icon is added for CBOverview.exe in Network folder and CB Overview dialog. Fixed issue, Example Data gives a message box for maximum appointment when user create appointments more than the limit. Solved some language phrase issue that comes in English for Other Languages. In Settings of CB the second option for copy appointments in other calendar sometimes the path is removed from that textbox. Fixed issue, Add-Ins is removed on repairing the Calendar Browser Client tool installation. In some special cases the Calendar Browser ribbon group was not visible. Improved performance with shared mailbox calendars. New registration method that can work with strict firewall settings. Bug fix: number of seats were not saved when a new calendar was created. Sometimes booking of one specific resource always requires booking of an additional resource. In these cases it will simplify the process if the additional resource can be booked automatically when the specific resource is booked. These auto-bookings are defined in the Calendar Browser Settings, under a new tab called Auto-Booking. Here all the resource calendars are listed to the left, and the additional booking for each resource can be selected to the right. The list is empty by default, and the admin will add “auto-booking-rules” as needed. When a user has booked supplies with the reservation of a resource, Calendar Browser can now automatically send an e-mail notification to an e-mail address defined by the administrator. If an item is removed from the Supplies items list in the earlier versions of Calendar Browser, it was not seen in any bookings made prior to the removal. Now it is possible to remove an item without losing it in a previous booking. When the administrator removes an item from the Supplies list in the Calendar Browser Settings, he/she will be asked if the item should be removed from existing bookings also. If the administrator clicks No, the item will only be removed from the Supplies items list so that it is not available for future bookings. It is now possbile to let users select information about host and attedees from dropdowns in the booking appointments. These dropdowns will be displayed in a new task pane in the appointment form if a checkbox in the Calendar Browser settings is activated and names and other information have been entered in the settings by the administrator. E-mail addresses/companies/departments of the participants, will be shown automatically after the name. The host of the meeting will be fetched from the Outlook profile and shown as default, but another host may be selected. When the participants has been selected this info is shown in the Overview. A new Booking summaries list will show the host and attendees of each meeting for a specified day. When a box in the Calendar Browser settings is enabled a log file will be added in a subfolder in the Calendar Browser network folder. In that file the administrator can see when bookings have been changed and by whom and what changes have been made. In the Calendar Browser Overview, reservations which have been made or modified at short notice may be highlighted with an hourglass. This feature is enabled in the Calendar Browser Settings. The time interval between the booking or change and the actual booking time for highlighting to occur is set by the administrator. A few users reported an error due to the missing dll file "System.Web.Extension.dll". This dll is now added to the Calendar Browserclient tool installer. New technology. The VB6 coding is replaced with with more modern .NET technologies. 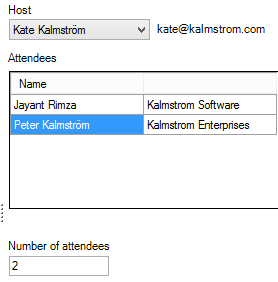 Users will not notice this directly, but with .NET it will be easier for kalmstrom.com to maintain and develop Calendar Browser in the future. Support also for the 64-bit version of Outlook 2010 and for both the 32- and the 64-bit versions of Outlook 2013. Possibility to generate Excel reports on passed resource usage. The dropdown for project selection in the appointment of the resource calendar will be converted into a button when the alternatives are more than 100. Clicking the button gives a dialog containing a list box with all the alternatives and a text box of the auto-complete type, so that selection of the desired value is easy and fast also when there are many projects. OLAP Reporting Tool is removed and replaced with Excel reports. This means that Calendar Browser is no longer dependent on Office Web Components. No need to restart Outlook after adding a resource calendar. Now the calendar is added to the Outlook calendar veiw directly. The Calendar Description and Calendar Browser Overview windows are closed when Outlook is closed by the user. The template for new appointment did not show a new line after saving the first time. Supplies could not be booked while creating new appointment. First the appointment needed to be saved and then supplies could be booked. Now, the supplies can be saved while creating a new appointment. The Example data was not adding body in example appointments. In the Archive tool the appointment body was not added in the database in a correct format. Sometimes the Archive tool failed to check for duplicate appointments. 25 February A few users were getting a permission error on Outlook startup due to a saving conflict in the settings item. This has been fixed, and the client tool has been changed to work and load faster. Works without a home page in the root Calendar Browser Outlook folder. This means that Calendar Browser now supports Office 365. Better possibility to add any Outlook calendar to Calendar Browser. Comma (,) and semicolon (;) are now accepted in Project names. Two new files are created when a user adds a Calendar Browser installation to Outlook. CBFOLDERSETTINGS.xml is located in the Calendar Browser network folder and contains information about the Outlook folder of that installation. CBGLOBALSETTINGS.xml is located in the OS application folder of each client machine and contains information about all Calendar Browser group folders added in Outlook. Some users had problems adding more than one direct booking calendar to Calendar Browser. Double booking and appointment copy was not working in Direct booking mailbox calendars. The default value of Place settings was not saved until after restart of Outlook. When Project Mandatory was enabled and a user tried to book supplies without setting a Project there was a runtime error. Now Calendar Browser will give a prompt to set Project instead. Dialogs for client tool installation and load example data appeared at the same time. If the option "Create copy of new appointments in personal calendar" was enabled some time Calendar Browser installations created multiple appointments in the personal calendar. When the Calendar Browser Manage exe was saved it disappeared but continued to run in the background. If the user then closed Outlook before the exe had stopped running it gave an error. Now the Calendar Browser Manage exe will not disappear until the settings are saved. Finnish version updated with the latest phrases. The Calendar Browser Example data will not work if Calendar Browser calendars are already present. That way there is no risk that someone overwrites real Calendar Browser calendars by mistake. The dependency on Office Web Components is removed from the Calendar Browser Example data, so now OWC are only needed for the statistics tool. In case the Calendar Browser folder has been changed or was not selected during the installation the client had to select it at the first time start of Outlook after the client tool installation. Now Outlook will start without problem and show the option “Go to CB” in the Outlook calendar view if necessary. Most users will never have to do this, and the prompt will be hidden from them. The Calendar Browser Overview loads faster. Earlier it was loading all appointments in all calendars. but now it loads them one month from current date by default. Users can select a date range to load. Appointments are loaded faster in the Calendar Browser overview. When multiple Outlook profiles were installed on the same pc, Calendar Browser was giving an error "not able to load folder". The Calendar Browser Overview was not showing recurring appointments in a proper format and sometimes also in wrong date range. In Outlook 2010 it happened that Calendar Browser did not show its toolbar to select project and booking for appointments. Now Calendar Browser works with MS Outlook 2007 or higher. Homepage view is not used now. There is a Calendar Browser group under standard Outlook Calendars which contains custom calendars and Calendar Browser section on the toolbar of 2007 or ribbon of 2010 with the Calendar Browser buttons. 11. When “Day” view was not selected in CB Overview and in Week II and Month view user wanted to see all day events then Overview application gave a runtime error. It is handled correctly now. Don't have the latest version? Download it and upgrade your installation!